I live in New York City and have been following the Occupy Wall Street activities here (and associated activities elsewhere) since they began last fall. I hadn’t been directly involved, but recently that changed, and on May Day I facilitated an open access teach-in with my fantastic colleagues Jill Cirasella and Alycia Sellie from the Brooklyn College library of the City University of New York (I’m in the library at another CUNY college, NYC College of Technology). Our teach-in was part of The Free University of NYC: an event planned to reimagine higher education alongside all of the other May Day demonstrations and protests. The Free U set up shop in Madison Square Park near the Flatiron Building in Manhattan, and encouraged teachers to bring classes and anyone to sign up to facilitate a teach-in, discussion, or skill share. “Admission” was free to all, and topics covered ranged widely, from discussions of mounting student debt and income inequality, to the work of Occuprint, a group that’s collecting the posters and visual culture of the Occupy movement, to an occupied figure drawing class. Jill, Alycia, and I have been active in OA advocacy at CUNY, and when we saw the call for participation we thought that the Free U would be a great opportunity to continue to advocate for access to scholarly research for all. We were scheduled for an early timeslot and the day dawned rainy and chilly, which meant that we didn’t draw huge crowds. But we had lots of great, lively conversation with the folks who did stop by, mostly graduate students and faculty at CUNY or other universities in NYC. We’d prepped for the possibility of a presentation, split between the three of us, but the opportunity for one-on-one interaction allowed us to tailor discussions to the specific questions participants had, like: “How can I make my own work available for all to read?” and “Will depositing my articles in an institutional repository hand over control of my work to the university?” I’m absolutely certain that we were able to change a few minds about open access that morning. All in all it was a great day, and since then I’ve found myself returning to thoughts about how to bring the open access message outside of the academic library. In all of my mulling I was reminded of this great UK website Who Needs Access? You Need Access!. This OA advocacy site was launched earlier this year, and provides real-world examples of the benefits of access to published research from teachers, patients, nurses, artists, and others. I think it’s a great resource to use for our advocacy work. And last week our own Steven Bell posted over at Library Journal about bringing the work of academic librarians outside of the library. Steven suggests a number of different venues and outlets we might consider, including the increasingly-popular Massively Online Open Courses (MOOCs), local talks at unconventional locations like bars or restaurants, and skill-share or other community educational opportunities, some free and some fee-based. Outlets like these could be another way for us to spread the word about open access beyond the walls of our libraries and campuses. 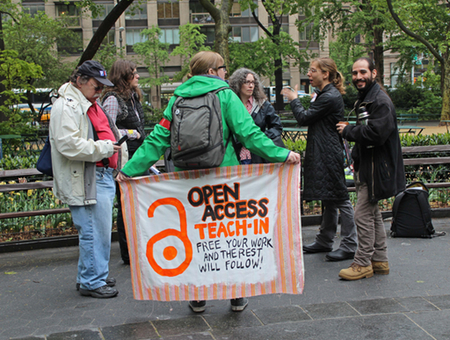 Are you advocating for open access publishing outside the library? If so, tell us about it!